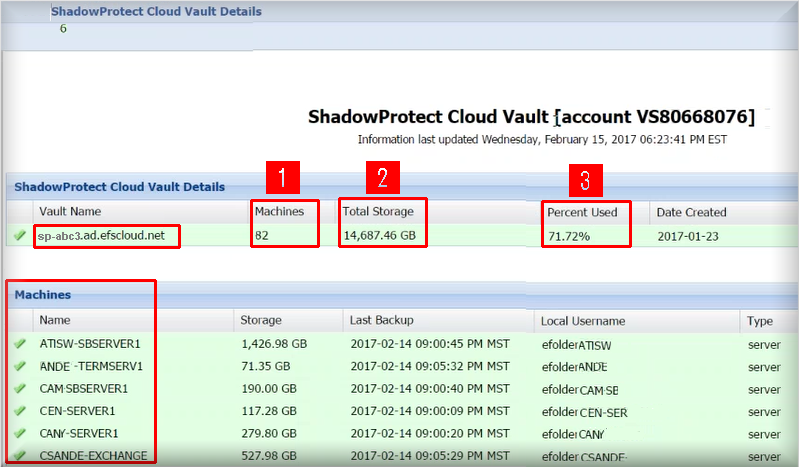 Axcient's monitoring tools for BDR for ShadowProtect Cloud vaults include machine-level reporting and access to detailed views from a variety of convenient locations in the Axcient portal. Email notifications are also available, to proactively alert partners and customers. Axcient’s detailed monitoring and reporting for BDR for ShadowProtect Cloud vaults includes machine-level reports and access to detailed views from a variety of convenient locations in the Axcient portal. Email notifications are also available, to proactively alert partners and customers. Details about the Axcient BDR for ShadowProtect monitoring and reporting are found below. 1. Open the Axcient Backup Portal by navigating to https://backup.securewebportal.net/ and logging in using your account credentials. NOTE: If you do not see this “graph” icon in the Account Center or on the Dash Panel, it means this account is not currently associated with any Axcient Cloud replicated machines. Please contact www.efolder.net/help or call us at 800-352-0248 if you have questions about this. When your account enters a warning or error state, an “event alert” will notify you that action is needed. The event alert can take the form of an email or it can be a notification pushed to a PSA. You can configure an email notification to be sent, once per day, containing data from the 30-DayTrending report, as well as all individual Detailed Machine-Specific Usage reports. 1. Select the My Account > Notifications menu item. Note: If an administrative login has been used, and notification changes are needed to a specific account, the account in question must first be impersonated before selecting My Account>Notifications. 2. 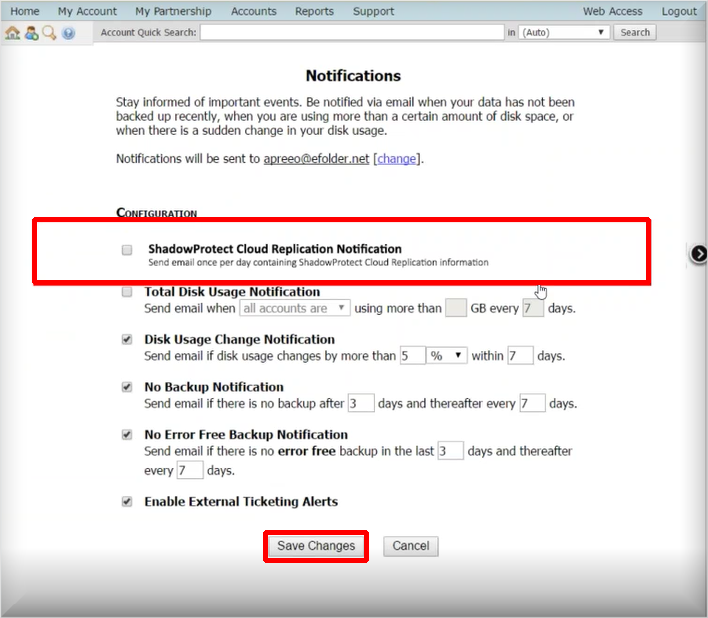 Check the ShadowProtect Cloud Replication Notification checkbox. 3. Then click Save Changes. Axcient provides one or more cloud vaults for each partner (based upon GB usage). The cloud vault acts as the destination for replicated data for each of the Partner’s customers. Each cloud vault has a running version of ImageManager. ImageManager running in the Axcient cloud can be used to set your cloud retention and actively consolidates daily incrementals into weekly and monthly incremental files. Axcient provides visibility into the number of machines replicated and the data stored via the Cloud Vault report. All of your customers who are replicating machines into the Axcient ShadowProtect Cloud are allocated space within your specifically-assigned Cloud vault(s). The Dash Panel Cloud Vault report shows detailed information organized by Cloud vault and is updated every 60 minutes. You can now see which customers are in which vaults, as well as when your vaults are reaching full capacity. 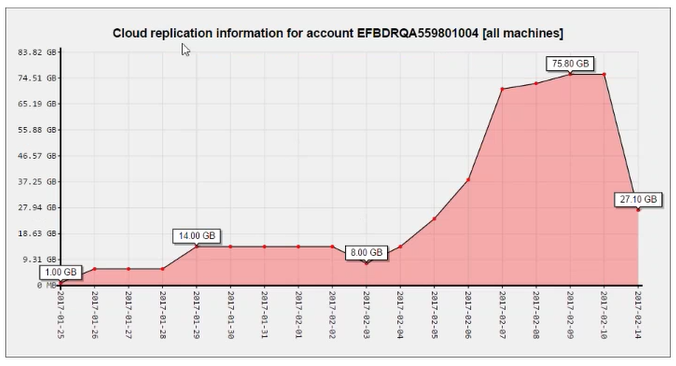 As you scroll down through this report, you will notice that each machine being replicated to the Cloud in this vault appears by Name, along with details describing how much storage space is currently being used by that machine, when the last backup occurred, the local username of that machine’s associated account and whether the machine is a desktop or server. This report is being updated every 60 minutes, so the totals change throughout the day, as activities occur within each vault. 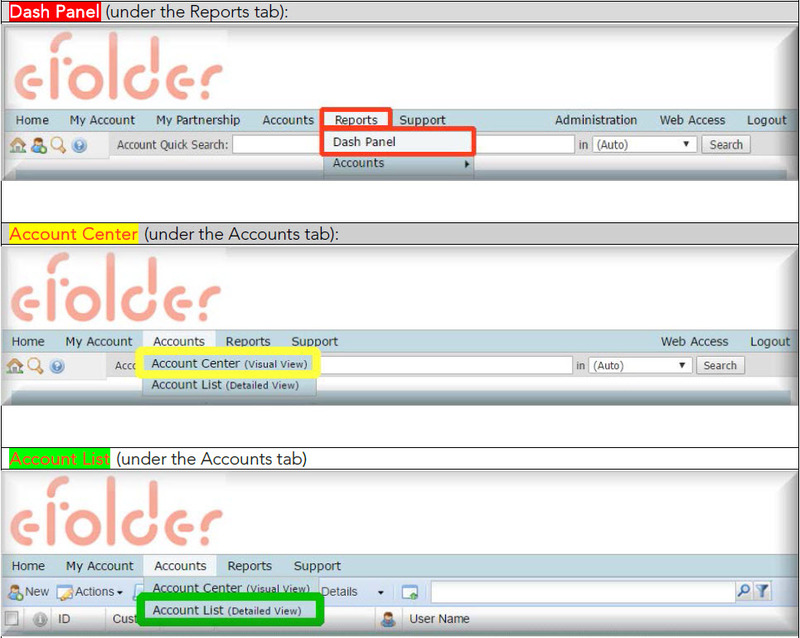 If you need to see information about a deleted machine, a check box is provided on this report, which will allow you to Show Deleted. This report shows an aggregate view of data stored for all machines replicated to the Axcient Cloud per account or customer. Whether you are monitoring one machine or thousands, this graph displays all machines replicating into the Axcient Cloud (for a single account). We collect data every hour, then display one averaged number for each 24-hour period. This is a rolling report, showing the activity for the last 30 days, including today. In addition to the aggregate account report, each individual machine being replicated into the Axcient Cloud has its own unique report. All machine-specific reports will display on one scrollable screen, following the 30-DayTrending Report. This report will give you a view into the current data stored in the Axcient Cloud per machine and the day by day growth of data stored over the last 30 days. Note: Total daily data usage numbers on the 30-DayTrending Report will often vary slightly from the running totals displayed on the individual Machine-Level Reports. This occurs because (a) the 30-DayTrending Report uses averages for a full 24-hour day, combining high and low usage numbers across a full 24-hour time period and (b) the running total displayed on the individual Machine-Level Report is only the latest hourly calculation, based on usage over the last 60 minutes, and does not reflect the entire 24-hour time period. In addition to 30 day trend reports, detailed status information is also provided on a per account and per machine basis. Status information includes errors such as ShadowProtect chain breakages and any errors surfaced in the ImageManager logs. 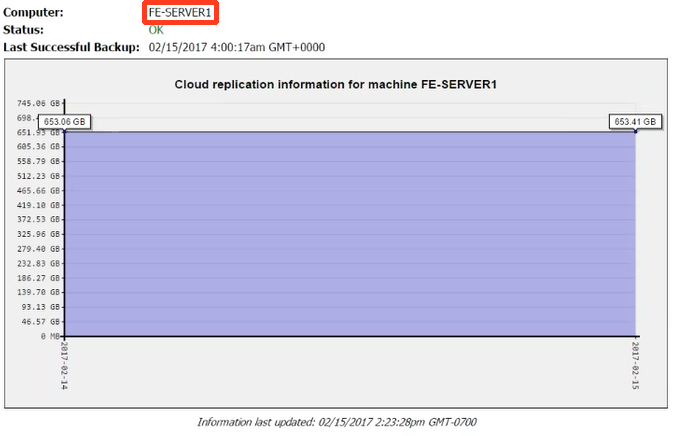 Each machine being replicated into the Axcient Cloud now produces an individual report with Computer name, Status, and Status Details. When a Cloud vault reaches more than 75%, capacity, you will receive a warning message. When a Cloud vault reaches more than 90%, capacity, you will receive an error message. When a vault reaches capacity, you will need to request a new vault from Axcient and decide how to move your customers into the new space. Please contact www.efolder.net/help or call us at 800-352-0248 to request a new vault and decide how to move customers into the new space. Copyright © 2017 Axcient Inc. All rights reserved. Axcient , Inc. is the sole author of this document; use of the StorageCraft and ShadowProtect trademarks does not imply official endorsement by StorageCraft Technology Corporation. Axcient and the Axcient logo are trademarks of Axcient Inc. StorageCraft, ShadowProtect, and their respective logos are a trademarks of StorageCraft Technology Corporation. AXCIENT AND STORAGECRAFT TECHNOLOGY MAKE NO WARRANTIES, EXPRESSED OR IMPLIED, IN THIS DOCUMENT.